Projects | Lumina Gold Corp.
Access to the property is via paved and gravel roads. 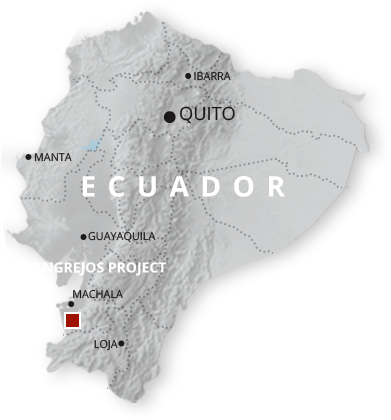 The Cangrejos project is located in SW Ecuador, 30 km SE of the Pan American Highway and 40 km from the deep water commercial port of Puerto Bolivar. Access to the property is via paved and 8 km of gravel roads. The company has a field camp and core facility located on the property. 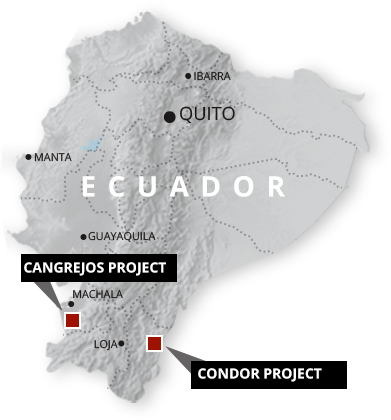 Odin Mining began operating in Ecuador in 1987 and during the 1990's operated several placer gold operations which produced 175,000 ounces of gold. The Cangrejos zone was discovered by hole CC-99-14 which intersected 1.57 g/t Au over 192m. Odin maintained some of the concessions and recommenced exploration in 2011.